Improve productivity and cleaning results with the Advance model SC1500. This stand-on automatic scrubber is compact and easy to maneuver. Even though its contact it still has a large capacity tank, maximizing the operator’s cleaning time, making it cost effective. This SC1500 comes in a 20-inch disc or 20-inch REV model. The REV model uses Advance’s patent pending Dual Random Orbital Scrubbing technology. This allows for a more consistent clean by scrubbing deeper, meaning no swirl marks while still using less water and chemicals. This machine’s low flow rate and 12-gallon solution tank gives it up to 109 minutes of run time on a single tank. It has 88 pounds of down pressure to give amazing cleaning results with a single pass. The SC1500 makes consistent cleaning easy with the ability to control the solution flow rate with a single button. The solution flow rate can be changed from low, medium, to high with the push of a button. This makes it easy to customize to any task. Saving the operator time since they don’t have to dump and refill as often. It also lessens the amount of water and solution being used. Solution rate and flow, brush pressure, and the vacuum are controlled by the same singular button. The LCD display makes it easy for the operator to see what setting they have selected. The SC1500 has a large recovery tank lid that gives you the ability to see the entire tank when cleaning it out. The lid utilizes press in gaskets that makes gasket replacement a breeze and ensures a great seal. 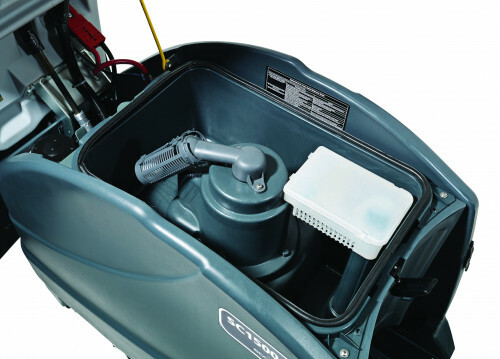 The debris catch bin inside the tank reduces the chance of a clogged drain hose by collecting the debris before it can settle to the bottom of the recovery tank. 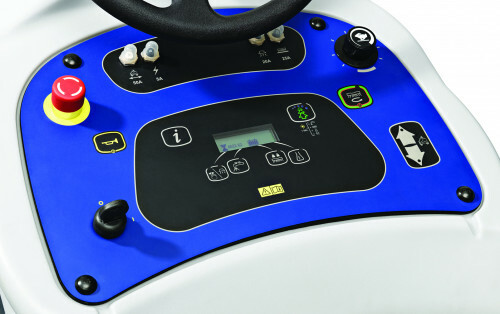 The control system on the SC1500 is very intuitive as each button has an icon that clearly indicates its function. One-Touch™ operation is utilized on this scrubber and steering system is very ergonomic for the operator offering forward and reverse functionality at the press of a button.